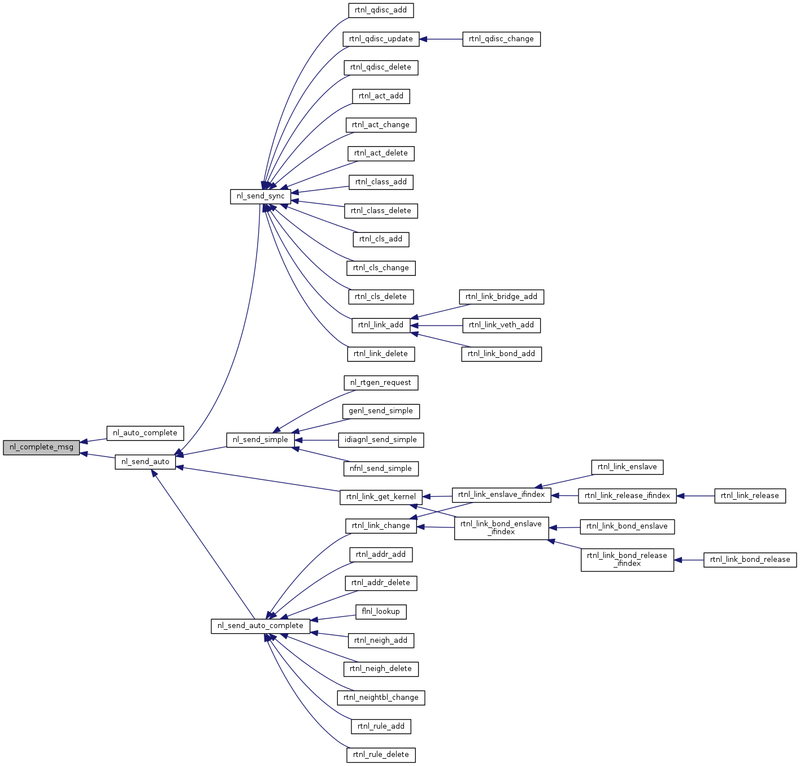 Connection management, sending & receiving of data. Create file descriptor and bind socket. Creates a new Netlink socket using socket() and binds the socket to the protocol and local port specified in the sk socket object. Fails if the socket is already connected. If available, the close-on-exec (SOCK_CLOEXEC) feature is enabled automatically on the new file descriptor. This causes the socket to be closed automatically if any of the exec family functions succeed. This is essential for multi threaded programs. Definition at line 85 of file nl.c. 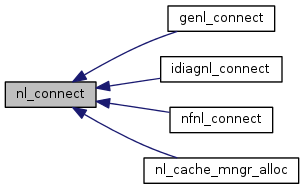 Referenced by genl_connect(), idiagnl_connect(), nfnl_connect(), and nl_cache_mngr_alloc(). Closes the Netlink socket using close(). The socket is closed automatically if a struct nl_sock object is freed using nl_socket_free(). Definition at line 157 of file nl.c. Transmit raw data over Netlink socket. Transmits "raw" data over the specified Netlink socket. Unlike the other transmit functions it does not modify the data in any way. It directly passes the buffer buf of size to sendto(). The message is addressed to the peer as specified in the socket by either the nl_socket_set_peer_port() or nl_socket_set_peer_groups() function. Because there is no indication on the message boundaries of the data being sent, the NL_CB_MSG_OUT callback handler will not be invoked for data that is being sent using this function. Number of bytes sent or a negative error code. Definition at line 197 of file nl.c. 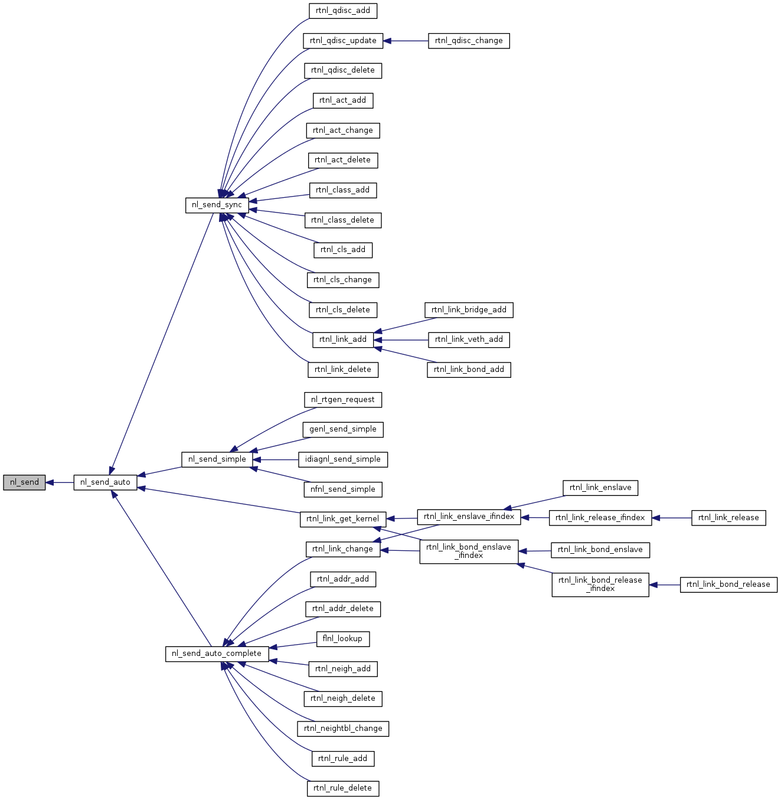 Transmits the message specified in hdr over the Netlink socket using the sendmsg() system call. The msg argument will not be used to derive the message payload that is being sent out. The msg argument is only passed on to the NL_CB_MSG_OUT callback. The caller is responsible to initialize the hdr struct properly and have it point to the message payload and socket address. This function uses nlmsg_set_src() to modify the msg argument prior to invoking the NL_CB_MSG_OUT callback to provide the local port number. This function triggers the NL_CB_MSG_OUT callback. Think twice before using this function. It provides a low level access to the Netlink socket. Among other limitations, it does not add credentials even if enabled or respect the destination address specified in the msg object. Number of bytes sent on success or a negative error code. Definition at line 251 of file nl.c. This function is identical to nl_send() except that instead of taking a struct nl_msg object it takes an IO vector. 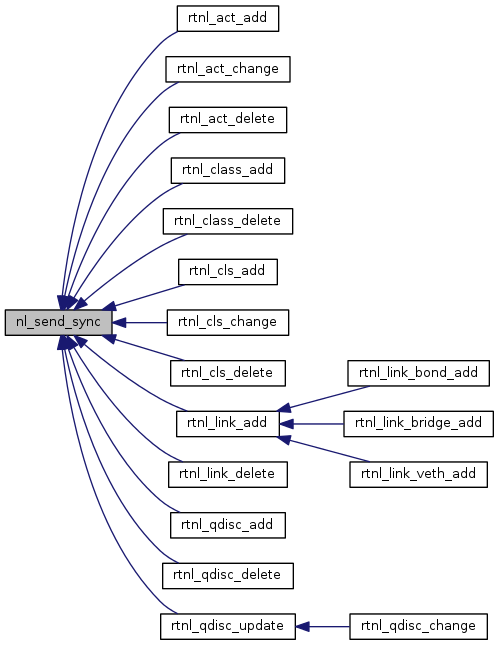 Please see the description of nl_send(). Definition at line 294 of file nl.c. Transmits the Netlink message msg over the Netlink socket using the sendmsg() system call. This function is based on nl_send_iovec() but takes care of initializing a struct iovec based on the msg object. The message is addressed to the peer as specified in the socket by either the nl_socket_set_peer_port() or nl_socket_set_peer_groups() function. The peer address can be overwritten by specifying an address in the msg object using nlmsg_set_dst(). If present in the msg, credentials set by the nlmsg_set_creds() function are added to the control buffer of the message. Calls to this function can be overwritten by providing an alternative using the nl_cb_overwrite_send() function. Unlike nl_send_auto(), this function does not finalize the message in terms of automatically adding needed flags or filling out port numbers. Definition at line 368 of file nl.c. This function finalizes a Netlink message by completing the message with desirable flags and values depending on the socket configuration. If not yet filled out, the source address of the message (nlmsg_pid) will be set to the local port number of the socket. If not yet specified, the next available sequence number is assigned to the message (nlmsg_seq). If not yet specified, the protocol field of the message will be set to the protocol field of the socket. The NLM_F_REQUEST Netlink message flag will be set. The NLM_F_ACK flag will be set if Auto-ACK mode is enabled on the socket. Definition at line 402 of file nl.c. References NL_AUTO_PORT, NL_AUTO_SEQ, and nlmsg_hdr(). Referenced by nl_auto_complete(), and nl_send_auto(). Finalize and transmit Netlink message. Finalizes the message by passing it to nl_complete_msg() and transmits it by passing it to nl_send(). Definition at line 437 of file nl.c. Referenced by nl_send_auto_complete(), nl_send_simple(), nl_send_sync(), and rtnl_link_get_kernel(). Finalize and transmit Netlink message and wait for ACK or error message. 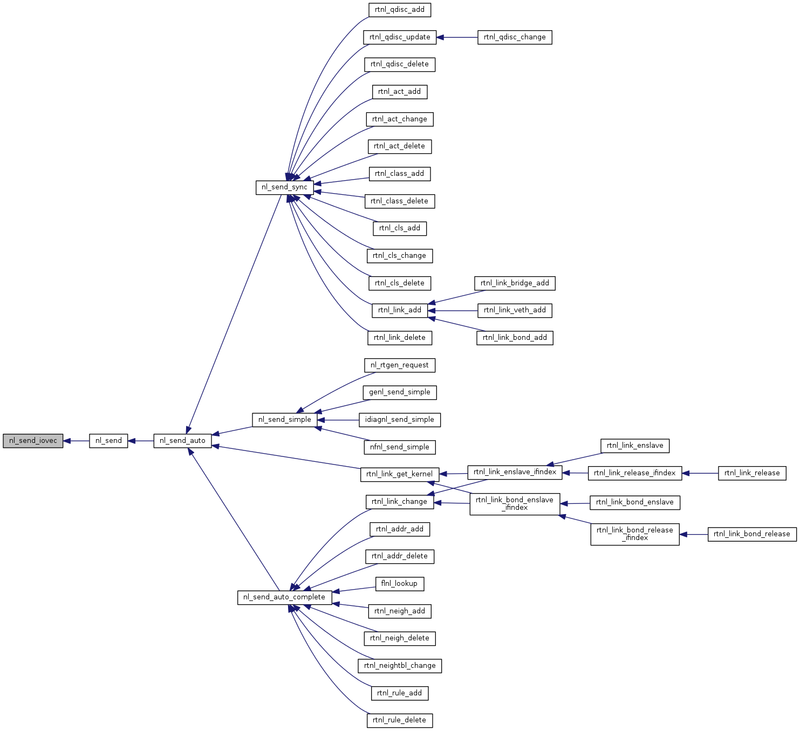 Passes the msg to nl_send_auto() to finalize and transmit it. Frees the message and waits (sleeps) for the ACK or error message to be received. Disabling Auto-ACK (nl_socket_disable_auto_ack()) will cause this function to return immediately after transmitting the message. However, the peer may still be returning an error message in response to the request. It is the responsibility of the caller to handle such messages. This function frees the msg object after transmitting it by calling nlmsg_free(). Definition at line 469 of file nl.c. Referenced by rtnl_act_add(), rtnl_act_change(), rtnl_act_delete(), rtnl_class_add(), rtnl_class_delete(), rtnl_cls_add(), rtnl_cls_change(), rtnl_cls_delete(), rtnl_link_add(), rtnl_link_delete(), rtnl_qdisc_add(), rtnl_qdisc_delete(), and rtnl_qdisc_update(). Construct and transmit a Netlink message. Allocates a new Netlink message based on type and flags. If buf points to payload of length size that payload will be appended to the message. Sends out the message using nl_send_auto() and frees the message afterwards. Number of characters sent on success or a negative error code. Definition at line 501 of file nl.c. References nl_send_auto(), nlmsg_alloc_simple(), nlmsg_append(), and nlmsg_free(). 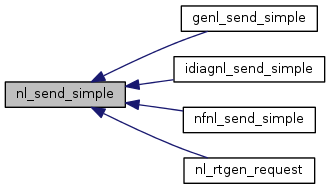 Referenced by genl_send_simple(), idiagnl_send_simple(), nfnl_send_simple(), and nl_rtgen_request(). Receive data from netlink socket. Receives data from a connected netlink socket using recvmsg() and returns the number of bytes read. The read data is stored in a newly allocated buffer that is assigned to *buf. The peer's netlink address will be stored in *nla. This function blocks until data is available to be read unless the socket has been put into non-blocking mode using nl_socket_set_nonblocking() in which case this function will return immediately with a return value of 0. The buffer size used when reading from the netlink socket and thus limiting the maximum size of a netlink message that can be read defaults to the size of a memory page (getpagesize()). The buffer size can be modified on a per socket level using the function nl_socket_set_msg_buf_size(). If message peeking is enabled using nl_socket_enable_msg_peek() the size of the message to be read will be determined using the MSG_PEEK flag prior to performing the actual read. This leads to an additional recvmsg() call for every read operation which has performance implications and is not recommended for high throughput protocols. An eventual interruption of the recvmsg() system call is automatically handled by retrying the operation. If receiving of credentials has been enabled using the function nl_socket_set_passcred(), this function will allocate a new struct ucred filled with the received credentials and assign it to *creds. The caller is responsible for freeing the buffer. The caller is responsible to free the returned data buffer and if enabled, the credentials buffer. Number of bytes read, 0 on EOF, 0 on no data event (non-blocking mode), or a negative error code. Definition at line 577 of file nl.c. Receive a set of messages from a netlink socket and report parsed messages. cb set of callbacks to control behaviour. This function is identical to nl_recvmsgs() to the point that it will return the number of parsed messages instead of 0 on success. Number of received messages or a negative error code from nl_recv(). Definition at line 950 of file nl.c. 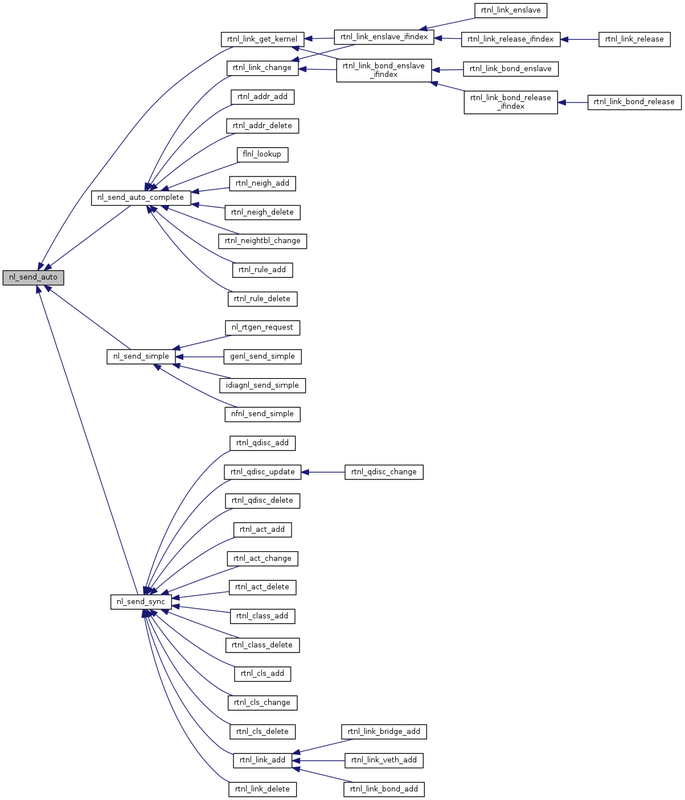 Referenced by nl_cache_mngr_data_ready(), and nl_recvmsgs(). Receive a set of messages from a netlink socket. Repeatedly calls nl_recv() or the respective replacement if provided by the application (see nl_cb_overwrite_recv()) and parses the received data as netlink messages. Stops reading if one of the callbacks returns NL_STOP or nl_recv returns either 0 or a negative error code. A non-blocking sockets causes the function to return immediately if no data is available. 0 on success or a negative error code from nl_recv(). Definition at line 975 of file nl.c. Referenced by nl_pickup(), nl_recvmsgs_default(), and nl_wait_for_ack(). Receive a set of message from a netlink socket using handlers in nl_sock. Calls nl_recvmsgs() with the handlers configured in the netlink socket. Definition at line 991 of file nl.c. The netlink socket must be in blocking state. Waits until an ACK is received for the latest not yet acknowledged netlink message. Definition at line 1010 of file nl.c. References NL_CB_ACK, nl_cb_clone(), NL_CB_CUSTOM, nl_cb_set(), and nl_recvmsgs(). Pickup netlink answer, parse is and return object. Definition at line 1068 of file nl.c. References nl_cb_clone(), NL_CB_CUSTOM, nl_cb_set(), NL_CB_VALID, and nl_recvmsgs(). Definition at line 1106 of file nl.c. Definition at line 1114 of file nl.c. 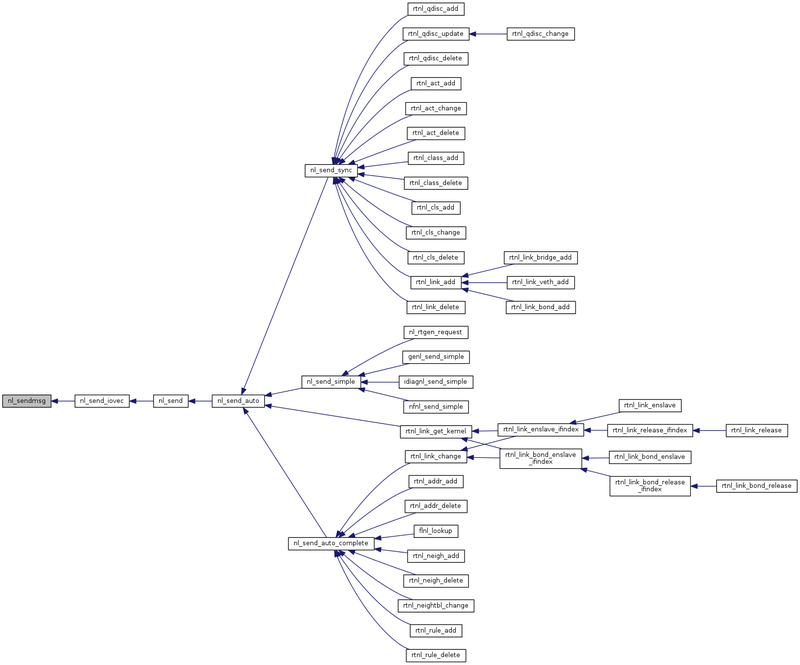 Referenced by flnl_lookup(), rtnl_addr_add(), rtnl_addr_delete(), rtnl_link_change(), rtnl_neigh_add(), rtnl_neigh_delete(), rtnl_neightbl_change(), rtnl_rule_add(), and rtnl_rule_delete().